As LeBron James, Carmelo Anthony, Dwyane Wade and Chris Paul spoke strongly at the 2016 ESPYS about change and social justice, Stephen Curry sat in the stands watching. The Golden State Warriors All-Star guard isn’t a member of the NBA superstar “banana boat” crew who have been extremely close friends for years. But he is a major star athlete in his own right who can challenge James in an NBA popularity contest. What LeBron, Melo, CP and D-Wade said was amazing, brave, transparent and necessary. And afterward, Curry responded with words of wisdom of his own that showed he was ready for the worldwide social stage, too. “I also want to thank LeBron, C.P., Melo and D-Wade for their message of using our platform to help change the world. That’s what sports is all about. We inspire a lot of people, so thanks for what you did,” said Curry, after landing the 2016 ESPYS Best Record Breaking Performance award. With his nearly half-court — and sometimes three-quarter court — 3-pointers, ankle-breaking moves and nights scoring 30-plus points, Curry’s game speaks volumes. The reigning two-time NBA MVP was a very close second to James in 2017 NBA All-Star starters balloting, with 1,848,121 votes to 1,893,751, respectively. NBA.com recently revealed that Curry had the league’s hottest selling jersey. Off the court, trouble has never been a part of his life as a happily married man with two young daughters. A superstar basketball player with worldwide popularity and a squeaky clean image should be a leading voice of the people, right? But James, Anthony and San Antonio Spurs super woke coach Gregg Popovich lead the list as the most outspoken NBA voices. On the Warriors team, the voices of coach Steve Kerr, Kevin Durant, Draymond Green and “black historian” David West might be heard louder than Curry’s. As the son of a standout former NBA player and two educated parents, Curry’s much more of a Cosby kid-type than an underprivileged boy from the ‘hood. Former NBA All-Star Grant Hill, who grew up in an upper-class home, was also viewed that way. It can be hard to speak for the underprivileged when you’ve always had food, clothes, shelter and a dollar in your pocket. “I’m never going to be the guy that’s out front and center,” Curry said to the East Bay Times’ Marcus Thompson. Despite his words, Curry has shown that he can be that guy, and he should be. Curry doesn’t like talking politics, but was put in an uncomfortable position after Under Armour CEO Kevin Plank said on CNBC that embattled President Donald Trump was an “asset” to American business. “I agree with that description, if you remove the ‘et,’ ” Curry told the East Bay Times. A concerned Curry, who is worth an estimated $14 billion to the company, received several phone calls to calm his concerns on Wednesday — including one from Plank. The CEO reportedly told Curry that his words were only related to Trump from a business standpoint and not a pat on the back for what he stands for. Those words calmed Curry, who wasn’t afraid to walk away from Under Armor. 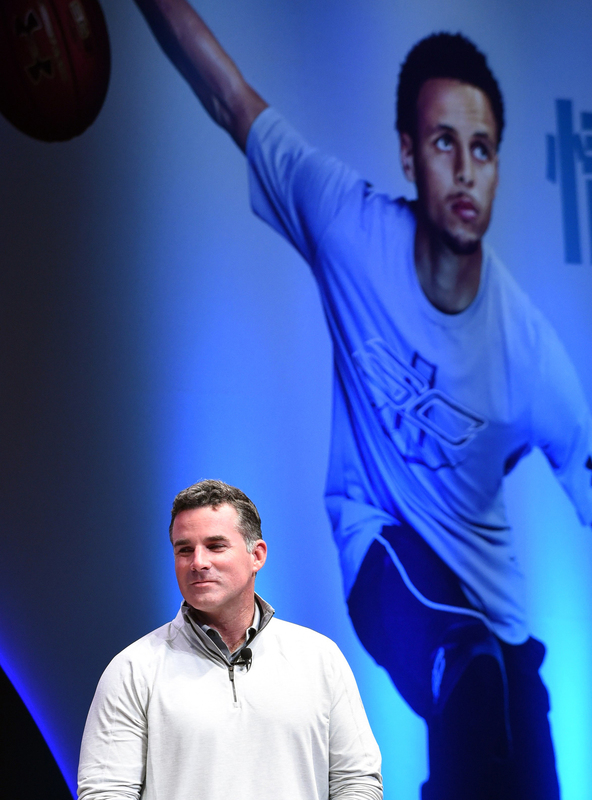 Under Armour founder, chairman and CEO Kevin Plank attended an event with the Golden State Warriors 2014-2015 season MVP Stephen Curry in Tokyo on Sept. 4, 2015. “If there is a situation where I can look at myself in the mirror and say, ‘They don’t have my best intentions, they don’t have the right attitude about taking care of people,’ ” Curry told the East Bay Times, “if I can say, ‘The leadership is not in line with my core values,’ then there is no amount of money – there is no platform I wouldn’t jump off if it wasn’t in line with who I am. “So that’s a decision I will make every single day when I wake up. If something is not in line with what I’m about, then, yeah, I definitely need to take a stance in that respect. This wasn’t the star player’s first time speaking out or taking action. In 2013, despite the risk of malaria, typhoid fever and yellow fever, Curry went to Tanzania during the NBA offseason to hang bed nets in mud huts for the anti-malaria program Nothing But Nets. Instead of being a spokesman for a sports drink or soda, Curry is a spokesperson for the water infiltration brand Brita for health and environmental reasons. “Drinking water is essential to a healthy lifestyle. Water is my drink. I like that Brita makes tap water taste good, so you don’t need to spend money or waste plastic with bottled water,” Curry once said. Curry was forced to comment when his hometown of Charlotte, North Carolina, lost the opportunity to host the 2017 NBA All-Star Game in light of the state’s “bathroom bill,” which mandates that people must use locker rooms and restrooms based on their gender at birth regardless of sexual identification. Before the NBA made its decision to withdraw from Charlotte, Curry made his thoughts on the matter clear. “No one should be discriminated against,” he said. Curry also joined then-President Barack Obama for a public service announcement that highlighted the importance of mentoring young people and openly supported Obama’s policies. The truth is that when the 28-year-old Curry does speak, people listen. Here’s hoping that in the near future Curry will be comfortable getting out of the stands and onto the stage to speak on social issues as James, Anthony, Wade and Paul have. The world needs Curry’s intelligent and strong voice just like the Warriors need his 3-pointers.